St. Maarten is a dynamic blend of Caribbean exuberance and Dutch paradise, a sun-soaked tropical island where the skies are forever blue and having a good time is just a way of life. There are a large number of fascinating places to discover in and around this wonderful Caribbean Island. From malls, fast food chains, theme restaurants, beachfront resorts and duty-free shopping to casinos and dance clubs – it’s all here in St. Maarten! St. Maarten is not exactly what you would call a tranquil, get-away-from-it-all, secluded island, but it does provide more than its share of fun and adventure! St. Maarten’s official currency is the Antillean Guilder. The American Dollar is accepted throughout the island. The exchange rate from dollars to guilders is fixed, one dollar being 1.78 Antillean guilders. The economy of St. Maarten is almost entirely based on tourism. According to surveys, almost 90% of all employment on the island is directly or indirectly related to tourism. Aside from tourism, some of the other forms of major economic activity on the island are trade and financial services with other neighboring islands. The Caribbean Island of St. Maarten has one of the highest per-capita incomes in all of the Caribbean. St. Maarten produces very little consumable goods and products. The government of the island is looking for new and better ways of diversifying the economy, especially with any industry that would uphold the main economic activity and would not harm tourism. The government is presently involved with zoning plans that will restrict an area of the island only for the manufacturing and light industry and another areas for heavy industry. Once this takes place, efforts will be made to attract other industries. The St. Maarten real estate market offers a wide and wonderful selection of opportunities. The cost of residential properties starts at roughly $300,000 for a condominium and extends well into seven figures for lavish seaside villas. A luxury beachfront condominium perfectly situated on the Simpson Bay Beach, having a fresh water pool in a pool house and a barbecue area would cost you about $875,000. A beautiful fully furnished waterfront condominium on the shores of Simpson Bay would cost around $73,200. Buying St. Maarten real estate is as easy as buying property in the United States. There are no residency requirements or any kind of legal restrictions that limit foreign home ownership, but you are required to obtain all the necessary legal documents and status for extended stays. On St. Maarten, you will automatically receive permanent resident status once you have completed ten years of living on the island. Until then, you must obtain temporary resident status by sending an application to the Lieutenant Governor’s Office, which is in Philipsburg. St. Maarten has high profile real estate professionals and some excellent developers who completely understand the St. Maarten real estate market and will guide you through all the required steps during the sale or purchase. One of the most sought-after destinations for Caribbean real estate investors to call home is definitely St. Maarten. The St. Maarten real estate market is booming as an increasing number of Europeans and Americans are choosing to make this Caribbean island their home. Drawn by its relaxed Caribbean attitude and sophisticated European lifestyle, who wouldn’t want to own a piece of land on this paradise? Whether you’re seeking to become a St. Maarten real estate investor, part time resident or simply just a vacationer, the Caribbean island of St. Maarten offers a distinct European island flavor that is hard to resist. Sports on the island of St. Maarten have grown dramatically and many of these activities are aimed at fun and fitness. Tennis, horseback riding, hiking, golf, volleyball and mountain biking are very popular. A whole host of water sports are also available, such as snorkeling, jet skiing, kayaking, parasailing, scuba diving, sailing, water-skiing, wind surfing and deep-sea fishing. One of the best ways to explore this Caribbean Island is to travel by foot. This way, you get to mingle with the locals and learn all about the customs and traditions. Above all, you get to see the breathtaking scenery and the awe-inspiring flora and fauna that one seldom notices when traveling on the main roads. For tourists who want to explore the natural beauty of St. Maarten on foot, there are miles and miles of footpaths that run through the mountains and all along the shore, revealing some of the most spectacular vistas. St. Maarten is a deceptively small island and presents some very interesting contrasts for visitors and residents. Long, beautiful beaches along the coastline, full of water surfers and people soaking up the sun, seem very different from the small towns and quiet country roads of the hillsides. In the evenings, the interior hills become a lot more peaceful while the glitzy casino and glittering clubs of the coast come alive. From local beach bars to ritzy clubs, thrilling casinos to laid-back lounges, St. Maarten’s nightlife is dynamic and vibrant and has something for everyone. St. Maarten is known for its effervescent nightlife scenes and draws visitors from all over the world. The temperature in St. Maarten remains constant all year round and averages around 80°F. The water temperatures average 78°F. Snowbirds and Caribbean real estate investors flock to St. Maarten to escape harsh European and North American winters. 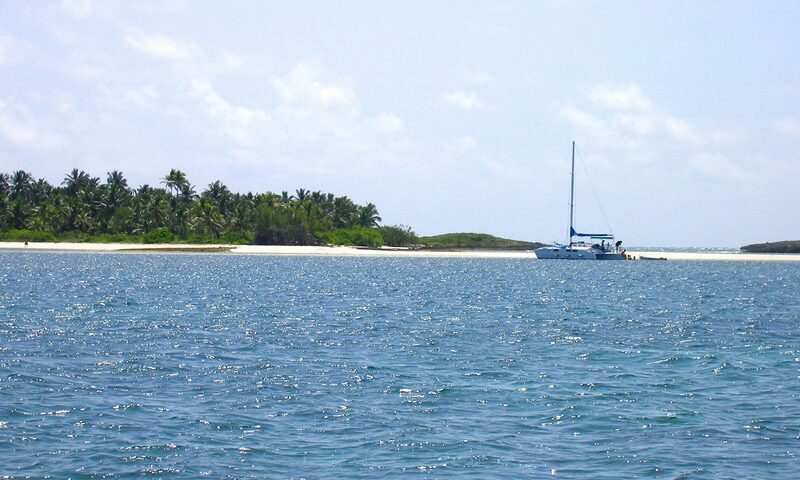 The tradewinds help moderate the temperatures on the island. In the late summers and early fall, there are occasional showers of rain and the average yearly rainfall is roughly 45 inches. The dress code throughout the island is generally casual. Casual clothes in light fabrics like cotton are typical. Swimwear should be confined to the poolside and beaches. In the evenings, women can get dressed up, but for men, jackets and ties are rarely seen. Some fancy resorts and hotels may require dresses for women and jackets for men at dinner, especially in the high season. Sunscreen, a hat and sunglasses are recommended for sun protection during the day. The Caribbean Island of St. Maarten is situated in the Caribbean Sea at about 18 degrees north and around 63 degrees west and lies roughly 150 miles southeast of Puerto Rico. It is the smallest landmass in the world to be shared by two sovereign governments. The entire island covers about 37 square miles, with the French side of St. Martin in the north covering about 21 square miles, and the Dutch side of St. Maarten in the south covering about 16 square miles. Princess Juliana Airport is situated in St. Maarten, near Simpson Bay and west of Philipsburg. There are many international flights that operate daily to and from St. Maarten. There are several car rental agencies all over the island of St. Maarten and rates vary from $25 to $55 per day. Traffic drives on the right. There are lots of motorbike and moped rental agencies scattered throughout the island, making it easier for tourists who are not comfortable driving around. Taxis are widely available and the whole taxi system on this Caribbean Island is quite reliable. Since they don’t have meters, all taxi drivers carry standard rate sheets with prices listed for most destinations on the island. It is customary to give the driver a 10 to 15% tip. There are taxi stands at Princess Juliana International Airport and Wathey Square. The bus transport system runs regularly throughout the island and also between the two sister capitals. Minibuses operate to and from some of the more popular destinations on the island. St. Maarten’s history began far towards the south, in the Orinoco river basin. It was from this region that St. Maarten’s first inhabitants, the Arawak Indians, migrated more than a thousand years ago. The Arawaks, who made St. Maarten their home, called it ‘Sualouiga’, which means ‘Land of Salt’. It was named after the salt pans that were found in the island. However, the peaceful existence of the Arawaks did not last for long. They were replaced by the Carib Indians, an aggressive, warrior people who took the island of St. Maarten for themselves – only to lose it to the Europeans. On November 11th 1493, which also happened to be the holy day of St. Martin of Tours, Christopher Columbus sighted the island. He declared it to be a part of Spain on that very day and to this day it still bears the name. More concerned with the greater conquests of South America and Mexico, the Spanish completely ignored the island. It was virtually forgotten by the Spanish, until the Dutch settlers resided on the island and began extracting salt from the ponds and exporting it out of the island. However, the commercial benefits of the island soon drew the attention of the Spanish, who came back and drove away the Dutch in 1633. The events that took place in Europe soon affected St. Maarten’s destiny. At the end of the eighty years’ war between the Netherlands and Spain, the Spanish no longer required St. Maarten and left. The Caribbean Island was soon claimed by the Dutch and the French, who after quite a few skirmishes signed a peace treaty in 1648, and the island was to be divided between the two of them. The diverse cultures of St. Maarten springs from the historical role that it has played as a crossroads for travelers to the New World. The French, Dutch and even British traders brought with them European traditions, while the African and Caribbean people brought with them the culture and language of West Africa. Today, the cultural influences are only reflected in the number of languages spoken on the island. The official language of St. Maarten is Dutch, but English is also spoken everywhere and taught in schools. Some of the other common languages are Spanish as well as Papiamento, which is a common dialect among the Netherlands Antilles people. The island’s biggest cultural event is the annual Carnival, which includes calypso competitions, parades, reggae shows and a never-ending array of stalls and stands that serve traditional island food. The Caribbean Island of St. Martin undoubtedly has a distinct French air about it. Police officers still wear képis, the towns are named Orléans and Colombier, the streets are called rues, and the French flag is hoisted over the gendarmerie in the capital city of Marigot. This Caribbean Island also boasts some of the best cuisine in the Caribbean, with a surprising number of good restaurants and bistros. Repeat visitors and residents cite St. Martin as being a lot more prosperous, sophisticated and stylish than both Martinique and Guadeloupe. This Caribbean Island isn’t as cosmopolitan as Guadeloupe or Martinique, nor is it the jet set and royalty magnet that is swanky St. Barts. Nevertheless, with its European inspired duty-free shopping, its elegant French restaurants and its spectacular beaches, St. Martin is definitely refined. The official currency of St. Martin is the Euro, €. At present, the exchange rate from Euro to Dollars is €1 = $1.24. Most places accept U.S. Dollars and there are a few places that do accept the Netherlands Antilles Florin. All major credit cards are widely accepted throughout the island. ATM machines are also widely accessible. St. Martin’s economy is heavily dependent on the tourism industry. The island also receives income from offshore finances, petroleum refining and trade with other Caribbean islands. St. Martin’s economy has close ties with the outside world, as the outside is also very dependent on imported goods and products. Because St. Martin only produces a few profitable goods, it has to receive imports like food, crude petroleum and other manufactured items from Mexico and the U.S. The government has been making efforts to expand the economy with certain establishments of facilities for the manufacturing and light industry and some of the heavier industries without affecting tourism, which is by far the islands biggest income earner. The biggest boost to the island’s economy came with the construction of the Princess Juliana International Airport, which is how the island has become more accessible to tourists and Caribbean real estate investors. Until 1985, French St. Martin experienced a much slower growth rate than its Dutch counterpart. St. Martin has an international appeal, which has resulted in people from all over the glob investing in St. Martin real estate. With more than 80 nationalities residing here, both part time as well as full time, the St. Martin real estate market has stabilized. St. Martin real estate owners have seen a rise in property values in the last decade; in some cases, properties have doubled over the last couple of years. Due to the scarcity of land, the current trend is tilting towards condominium developments. Gated developments that offer ‘resort-like’ amenities are extremely desirable. From luxury condominiums to lavish beachfront houses and lagoon facing homes to modest apartments and kitschy cottages, the St. Martin real estate market offers some excellent investment opportunities. Luxury villas start at around $600,000. A conveniently located three-bedroom apartment in St. Martin would cost you about 130,000€. Luxury beachfront condos run about $750,000. St. Martin always has and always will continue to provide excellent Caribbean real estate investment opportunities that make for a magical experience along with concrete financial sense. Whether you are planning on staying for just a few weeks or a lifetime, the tropical island paradise with the French flair is sure to please even the most discriminating tastes. Famous for it’s spectacular beaches, the Caribbean Island of St. Martin has a large number of beaches that are each distinctively beautiful in their own way. For something a little more exciting you could probably check out the Treetop Adventure Park, where an entertaining traverse trail and a number of zip lines are suspended high above the private forest reserve, soaring high between mahogany trees and 200 year old mango trees. You will also find a unique area that has swinging ropes, suspended bridges and a lot more fun things. Miles and miles of well developed hiking trails and the ‘Hidden Forest Cake’ make this adventure unforgettable. Adventure sports range from water-skiing and jet skiing to windsurfing and parasailing. These activities are regularly offered at most of inland lagoons and popular beaches. Instructions and rentals tend to be considerably inexpensive. One of the biggest attractions of the island has always been the duty-free shopping. Exotic items from all over the world, like the Italian and French clothing fashions, Japanese and Dutch electronics, Chinese and Indonesian embroidery, leather, liquors, jewelry, crystal and even fine porcelain are available free of all customs and taxes and are offered at bargain prices. The Caribbean Island of St. Martin is indeed famous for its fine dining restaurants and the elegance of the local cuisine. From sophisticated French recipes to the most savory of all Creole delicacies to the slightly more exotic tastes of East Indian and Chinese cuisine, the island offers a large variety of bistros, barbecue shacks, restaurants and brassieres that are a delight to even the most refined of gourmet chefs. The people of St. Martin are extremely proud of their cooking, and it is considered an art on the island. Most restaurants also play music for dancing, just like many of the nightclubs that are scattered all over the island. From calypso to jazz to Zouk to reggae to pop, St. Martin’s bands play a variety of music. Because it is located in the tropics and is closer to the equator, the Caribbean Island of St. Martin experiences very little variation in temperature every year. Besides the temperature, tourists should consider tradewinds, humidity, rainfall and hurricane season when planning on visiting. In winters, the average temperature is about 75°F, while in summer the average temperature is about 90°F. Humidity, which is another major concern when it comes to the climate on the island, increases in summer. But, the tradewinds, along with the sea and air conditioning, goes a long way in moderating the humidity and heat. Hurricane season begins in the month of June and extends until November. It is during this period of time that the island experiences heavy rainfall. However, most find the climate in the island quite pleasant all year round, making it a haven for North American snowbirds and Caribbean real estate investors. Clothing should be neat, but comfortable and casual. Swimwear should be confined to the poolside and the beaches. The night dress code remains fairly informal, but shawls and jackets are recommended, as restaurants and casinos tend to get rather chilly. The Caribbean Island of St. Martin is located in the Caribbean Sea, and lies about 150 miles southeast of Puerto Rico. Being the smallest landmass to be shared by two separate governments, the whole island covers about 37 square miles, with French St. Martin in the North covering 21 square miles and Dutch St. Maarten in the South covering 16 square miles. The highest point on the whole island is the Paradise Peak, which is roughly 1,500 feet. If you are anywhere in the Caribbean you can fly by prop-plane into St. Martin’s small Espérance airport from the Caribbean islands of Guadeloupe, Martinique and St. Barts. All other international and local flights arrive at the Juliana airport, which is less than hour an hour away from Dutch St. Maarten. You can fly here from Antigua, Puerto Rico, Guadeloupe and most of the other neighboring Caribbean islands. KLM and Air France offer flights from Amsterdam and Paris respectively; you can also fly in from New York and Miami. Since it is located in the Caribbean, there are plenty of sea travel options as well. 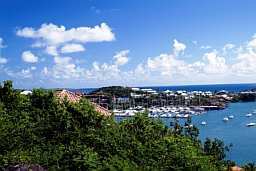 Getting to and from the other Caribbean islands is very easy, with daily ferry services from Anguilla and daily catamaran services to and from St. Barts, or a ferry that comes and goes to Saba several times a week. Yachts clear immigration at Marigot and will moor at Simpson Bay Lagoon, Anse Marcel, and Marinas in Marigot and Oyster Pond. If you’re willing to spend a bit of money, then you can arrive in style in a cruise ship. Taxis are available throughout the islands and there are taxi stands at the public marketplace. Buses are the cheapest way to get from one place to another. However, if you are planning on traveling to far off places within this Caribbean Island, then bus services are not so reliable. There are bus stops at Rue de Hollande in Marigot, but in rural areas you can stop buses anywhere. There are private minibuses that also travel along major routes and run more frequently and charge according to the distance. Hiring a motorcycle or car is a good alternative for reaching far off destinations and you’ll find rental agencies at the airports or at major hotels. Traffic drives on the right. Bicycles can also be rented, but this option is not advisable because St. Martin is quite hilly and it isn’t very easy to cycle around. Before Christopher Columbus arrived in St. Martin during his second voyage in 1493, this Caribbean Island was already inhabited. The first settlers were the Arawak Indians who migrated here from South America. They named the island ‘Sualouiga’ or the ‘Land of Salt’ after the brackish water and salt pans that are found here in abundance. The Arawak Indians were later replaced by the more aggressive Carib Indians who migrated from North America, and after whom the Caribbean is named. Columbus never really set foot on the island, but instead claimed it for Spain while he was passing by. The Caribbean Island was sighted on November 11, 1493, which is also the feast of St. Martin, therefore giving the island its name. Apart from giving a title to the island, the Spanish never really took any interest in the island; so the Dutch, looking for an outpost somewhere between their colonies in Brazil and Nieue Amsterdam, occupied St. Martin in 1631. In no time the Spanish, who wanted to retain their state monopoly, recaptured the island in 1633. Over the next decade, a number of failed attempts were made by the Dutch to regain their lost possession. Finally, St. Martin became a French colony. How the French and the Dutch divided the island is a subject of legend. Apparently, the two countries held a competition. Beginning from Oyster Pond, they had to walk westwards – the Dutch along the southern side and the French along the northern – and where they finally met they had to draw a line across the island. The Dutch set off having equipped themselves with gin, the French with wine. However, the bad effects of gin caused the Dutch to stop halfway through to sleep off their drunken stupor; subsequently, the French were able to walk farther and cover a greater distance. In reality, however, the French had a massive navy just off the shore and were able to win concessions by threat of force. However today, St. Martin is a community of Guadeloupe, which is a territory of France. French, Dutch and West Indian cultures have merged together on this tiny Caribbean Island. Carnival, with its costumes, parades and dancing, is celebrated before Lent and culminates on Ash Wednesday every year. With French influences, art, festivals, architecture and music remain the biggest attractions. This potpourri of cultures creates an exotic Caribbean atmosphere. The island is a collaboration of native Caribbean, African and European descent. While the people largely speak French, English is also widely known. Several playwrights, writers and poets reside in St. Martin, drawing upon its culture and history for their inspiration. Art galleries offer sculpture, lithography and paintings by local artists. Their work reflects the natural peace and beauty of this beautiful Caribbean Island and its people.